Services are scheduled for 9 a.m. Saturday, Nov. 19, at Our Lady of Grace Catholic Church for Francisco “Franky” Rodriguez Navarrette III of Las Vegas, Nev.
Navarrette, 44, passed away Saturday, Nov. 5, 2016, at his home. Interment will follow the services at Twin Oaks Memorial Park. A service and reception will be held following interment in the Our Lady of Grace Hall. All relatives and friends are welcome to attend. Franky was born May 16, 1972. He graduated from Artesia High School in 1990. Soon after graduation, he joined the U.S. Army and served his country as an 11 Bravo infantryman from 1990-94 in Fort Carson, Colo.
Franky was deployed in Desert Storm, where he served with dedication and bravery. He then finished his duty stateside. He received the Army Good Conduct Medal, National Defense Service Medal, Army Service Ribbon, Expert Qualification Badge – Hand Grenade, and Sharp Shooter Qualification Badge – M16 Rifle. The Honor Guard will present the colors and burial flag during the services. Franky traveled to different countries during his time in the Army. He also lived in Georgia, Texas, Colorado, where he graduated college, and California. He made his home in Las Vegas, where he worked in the casino industry and led a humble, happy life with many friends and family. 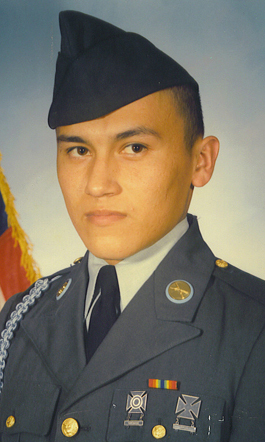 Survivors include his father, Frank Navarrette Jr., of Artesia; mother Yolanda Talavera and husband Edward of Roswell; sisters Elizabeth Molina and husband Theodoro, Vanessa Medrano and husband Israel, and Debralynn Soza, all of Roswell; brothers John Navarrette and wife Daniella of Odessa, Texas, Omar Pando and wife Missy of Artesia, and Michael Soza of Roswell; 17 nieces and nephews; 12 great-nieces and nephews; and many aunts, uncles, cousins and countless friends who loved and adored him and will miss him dearly. He was preceded in death by his grandmother, Longina “Ama” T. Navarrette, and grandfather, Francisco “Apa” A. Navarrette Sr.